At the outset I should emphasize that I am in no way an expert backgammon player. On a good day I would judge my skill level to be of intermediate standard. Readers who are familiar with the intricacies of pip counting would gain little from this tutorial. It is aimed to be a primer and a guide for beginners to progressively incorporate pip counting into their play. In the introduction to his Bible of Backgammon, Paul Magriel asserts that "Backgammon is emphatically not a game of mathematical calculations; it is primarily a game of position and strategya game of recognizing and anticipating visual patterns". However, in Chapter 10 the author provides a timely reminder that "Backgammon is essentially a race ... being able to determine your relative position in this race is often essential" (Magriel, at page 126). Determining your position in this race is achieved by calculating the difference between the number of pips (units of distance or spaces on the board your men travel) that you need to get all your checkers home and off the board, and the number our opponent needs. The result is the pip count and is calculated through the technique known as pip counting. Games start with a pip count of 167 to 167. In the following example at the closing stage of a game, Red has two checkers on the 6 point and White has one checker on the 6 point and two checkers on the 2 point. Red requires 12 pips to completely bear off (6 × 2 = 12), while White requires 10 pips (6 × 1) + (2 × 2) = 10. Therefore the pip count informs us that Red is 2 pips behind in the race. Red's pip count is 12. White's pip count is 10. 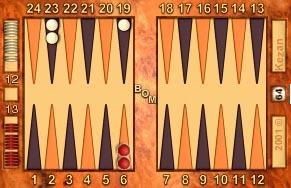 For the past 18 months, my backgammon games have been primarily played against various software programs or human adversaries via the Internet. When playing against programs like JellyFish, or on the Internet, a player usually has the luxury of determining the pip count by a swift click of the mouse. The pips for each player may be permanently displayed or the relative difference in pips (the pip count) may be easily at hand. Venture into the real world of face-to-face play and such information technology is not available to assist in our game. On many such occasions, I found my inability to count pips a serious handicap. 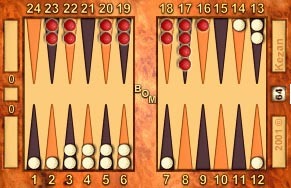 I quickly realized that a mastery of pip counting would enable my further progress along the backgammon learning curve. The backgammon literature informs us that an ability to swiftly count pips confers the master with a powerful advantage over the uninitiated in many common situations. The pip count is an essential factor in many cube decisions and can aid in determining the appropriate choice of strategy in mid-game holding positions. For example, Magriel provides a guideline for offering or accepting the cube in a racing situation. In a long race (about 100 pips) a player should be a minimum of 10 pips in the lead to offer a double, or a maximum of 13 pips behind to accept a double (Magriel, at page 132). The literature provides detailed descriptions of the many methods available. Some commentators have suggested that it is possible to keep a running total of the pip count right from the beginning of the game. I personally found this technique unworkable. I soon lost count and the constant mental processing involved distracted me from concentrating on other important aspects of the game. Magriel highlights three distinct methods to calculate the pip count: The Direct, The Comparison, and The Mental Shift techniques (Magriel, at pages 126 to 131). Other experts such as Jack Kissane have publicized other effective techniques such as the application of "reference positions". 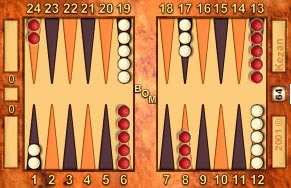 The Kissane methods are set out in detail at Backgammon Galore. The article there was originally published in the Chicago Point, Issue 52, November 1992. Each of the above methods requires some basic mathematical abilityadding, subtraction, and multiplicationand a decent memory. Some require recognition and/or visualization of basic reference positions. Concepts from one method may be applicable to the others. To decide which method is most suited to your personal style of mental processing, check out the references provided and give each a try. A short cut, and technique, which I found to be very effective, is explained in detail below. I first came across the concept on the news group archives section of the Backgammon Galore web site. It was originally posted on the newsgroup by Mark Denihan, 7 October 1996. The site also lists many other articles which may be of interest. The ability to remember a single two or three-figure number while undertaking the previous tasks. However, this method has an added advantage for a beginner. The full technique can be quickly learnt by breaking down the process into easily mastered stages of gradually increasing difficulty. Furthermore, mastery of each stage is very useful in itself by giving the beginner progressively more detailed information of their race standing. Bonus! Knowledge is power. Initially, ignore all the checkers of both players that have made it home. Observe the number and position of the remaining checkers you have on the board. Count the number of crossovers required to bring each checker into the home board. A crossover is the move of a checker of six spaces (or pips) from one quadrant of the board to the next quadrant. Example position, numbered from Red's perspective. In the example position above, White has managed to escape Red's menacing prime. It is a racing position as there can be no further contact between the opponents' checkers in this game. Red has two checkers on the seven point, four on the eight point and one checker on the nine point. Therefore, Red needs 7 crossovers to bring all her checkers into the home board. Same example position, numbered from White's perspective. 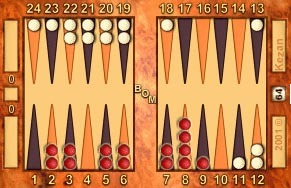 The view from White's side of the board (shown above) shows that 8 crossovers are needed to bring all her checkers home. Two crossovers for the checker on her 14 point, two more crossovers for each of the checkers on White's 13 point, plus one crossover for the checker on White's 12 and another for the checker on White's 7 point. Therefore we can deduce that Red is definitely leading the race by 1 crossover. Since a crossover corresponds to a move of six pips we can deduce from this exercise that Red leads by one crossover or roughly 6 pips. Now that we understand what a crossover is and how to calculate how many we need for all of our checkers to reach our homeboard, we need to visualize and remember where they land to be able to arrive at the exact pipcount. However, before going to that step in the tutorial, sometimes just knowing how many crossovers you are ahead or behind allows you to clearly see your advantage or disadvantage especially in doubling situations. To facilitate an improvement in the accuracy of this estimation, we must mentally move the checkers to see where they land. For example, if we pretend we are playing as Red in the Example Position below, we must consider that the white checker on the 13 point (White's 12) will land on White's 6 point and White will have three checkers to bear off from the 6 point. Beginners who have gained familiarity with the previous stages are now ready to calculate the exact pip count by including all the checkers on the board. Here is the example position again so that you don't have to scroll back up. Start with your own checkers. Calculate the number of crossovers and include the checkers on the 6 point. Multiply by six to get the subtotal then add the remaining checkers from the 5 point onwards to obtain a total count. Don't forget to include the checkers from the crossovers when calculating the number of checkers on each home board point! Remember your total, and then repeat the exercise for your opponent's checkers. The difference between these two totals represents your exact standing in the race. * Note: The asterisks indicate points where outer board checkers have landed from the crossovers and have been added to the checkers already there. From this full pip count we have verified that Red leads White by 11 pips, (98 − 87 = 11). In real live situations the pip count process will need to be done quickly. In many tournaments clock rules may apply. In club or social settings you may feel that you are under pressure to count quickly even though your opponents are not casting withering glances at you. Frequent practice will enable you to rapidly and accurately calculate the pip count. A good tool for practicing is to use a software program such as Jellyfish. Turn off the "display pip count" function and periodically try and calculate the result. To check your accuracy click on the display pip count button. If your calculation was incorrect, do it again and try and figure out where you went wrong. Practice makes perfect. Remember that in some real world settings there may be added distractions from a cacophony of music and conversation. It would be useful to gain some experience by practicing under similar conditions. An effective method is to play some raucous music (Metallica are my favourite for training), at the same time turn up the volume on the TV. Voilaan authentic caf�/bar ambience.